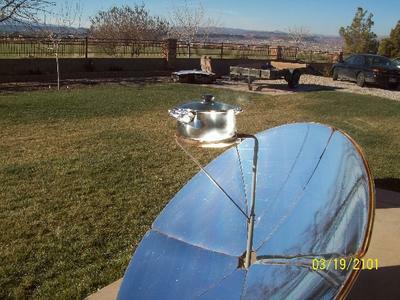 Saturday (Jan 05th 2013) was a bright, sunny and cold day, but perfect for solar cooking. I just can't stand to see all of that sun going to waste and so we decided to solar cook a number of things. 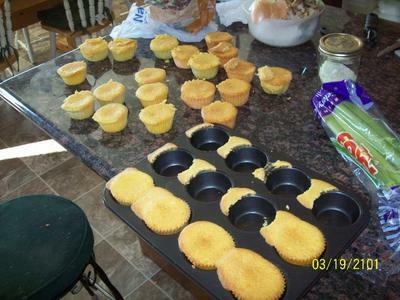 We started with Corn Muffin/Cake mix cupcakes. We love corn muffins, but the cake mix makes it that much sweeter and moist. 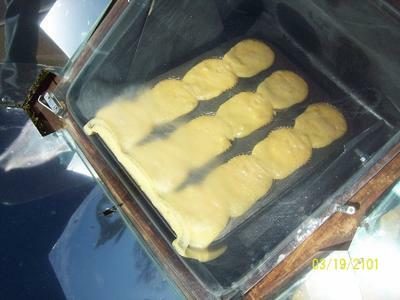 As you can see from the photo, you should not allow the solar oven to have even the slightest incline, because when the batter heats up it really starts to run...but as you can see, the muffins turned out alright, and very tasty. On the parabolic I did my customary popcorn for the evening snack and then we did a batch of clam chowder which we then put in the refrigerator to be warmed up later for dinner on Monday. For lunch though we cooked up hamburgers. Eight beef patties took only ten minutes to cook in two batches. All in all it was a very productive solar cooking day. ...What did you solar cook today?